This sounds a bit silly, doesn't it? How to hold your DSLR camera? It's pretty obvious: You pick it up with the lens pointing away from you, put your eye to the viewfinder and press the shutter button. Couldn't be simpler, right? Well, yes and no. Doing the above will certainly get a picture, but the way you hold your camera can help ensure you get a good picture. Blur is caused by the movement of either the subject or the camera. Subject movement is something we really can't control, although adjusting the shutter speed can give us some control over how subject movement is captured. Camera movement, however, is something we can control. Short of using a tripod or a VR, image-stabilized NIKKOR lens, holding the camera properly is the best way to avoid a blurry picture. You need to hold the camera as steady as possible. Hold the camera's handgrip in your right hand and cradle the camera body or lens with your left. Keep your elbows propped lightly against your torso for support and place one foot half a pace ahead of the other to keep your upper body stable. This is a steadier position than holding the camera away from your face. 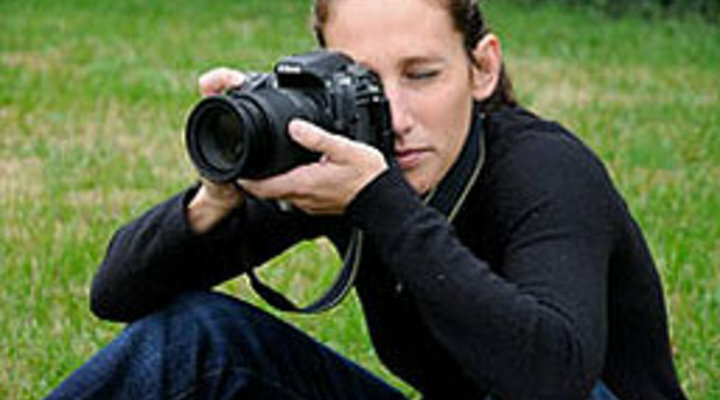 Use your left hand to cradle the lens, so that it's helping to support the weight of the camera. The added weight of a digital SLR can also help to steady the camera. Wrapping your left hand over the top of the lens makes it less stable and more likely that you'll move the camera while shooting. When you're ready to take the picture, press the shutter release button halfway to focus. When focus is complete, the selected focus point or points will be briefly highlighted. Smoothly press the shutter release button the rest of the way down to release the shutter and record a photograph. Try these suggestions and you may see less blur and more sharp, in-focus pictures. If it's windy or your shutter speed's getting slow (1/100 or lower) try to find something to lean your body against, like a tree or a pole. You can also place your elbows on a low wall or table. You may not always have a tripod with you, but you have a bipod—yourself. Do everything you can to be as solid a platform as possible for your camera, and it will reward you with sharper pictures. Getting sharper, more in-focus pictures can be as simple as learning how to hold your camera.